LANSING — As its chairman pushed for tax breaks to help spur a 52-story development in downtown Detroit, mortgage company Quicken Loans increased its efforts to develop relationships with Lansing lawmakers. According to new disclosures, Quicken Loans spent more on lobbying state government in the first seven months of 2017 — $159,475 — than it had spent in an entire year previously. Quicken Loans ranked as the 17th largest spender on lobbying in Michigan for the first seven months of the year, according to state data. Lobbyists and top officials working for Quicken Loans also wrote more checks to financially support lawmakers’ campaigns in 2017, according to campaign finance disclosures. 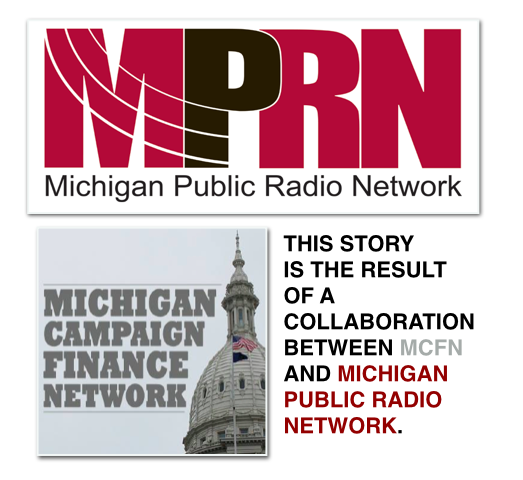 Those contributions tended to focus on Michigan House members. 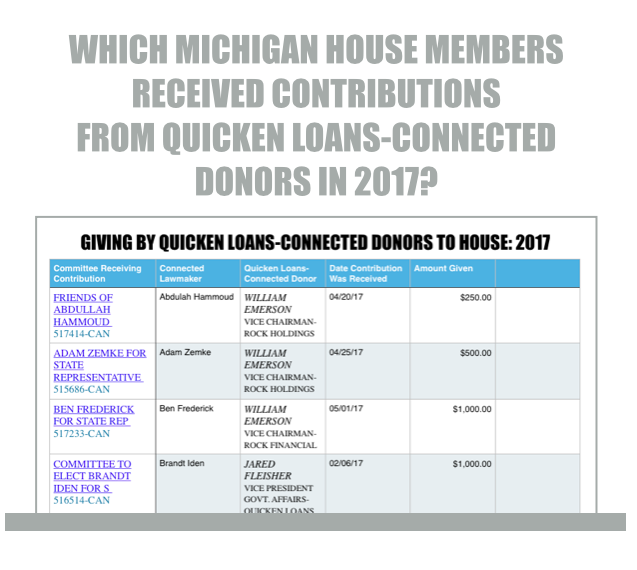 The committees of 56 state House members — about half of those serving in the House — received contributions from donors tied to Quicken Loans over the first seven months of the year. In 2016, bills to bring new tax incentives, supported by Quicken Loans and its owner, Dan Gilbert, stalled in the Michigan House. But on May 4, 2017, the House voted to approve a revised version of the bills. The main bill passed the House 85-22. Gov. Rick Snyder signed the bills on June 8. “This legislation is key to closing existing funding gaps surrounding brownfield sites and creating vibrant communities where Michiganders can live, work and play,” Snyder said in the press release announcing the bills’ signing. Over 2016 and the first seven months of 2017, Quicken Loans and Rock Ventures, another Gilbert business entity, disclosed spending a total of $303,552 on lobbying. That’s more than the two disclosed spending over the previous decade, 2006 to 2015. Over that 10-year period, the two combined to spend $263,509, according to disclosures. Rock Ventures was a registered lobbyist from 2013 to 2016. 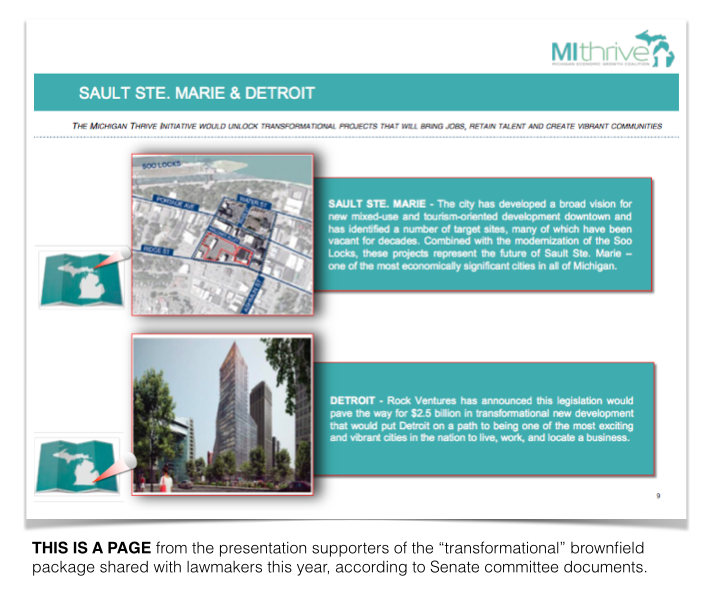 In Lansing, the incentive bills are known by some as the “brownfield bills” because they target incentives for developments that could be complicated by contamination. Others call them the “Gilbert bills” because of Gilbert’s work to support the proposals. Gilbert, the richest man in Michigan, according to Forbes, came to Lansing to testify in support of them in December 2016. The bills would allow for the capture of income tax revenue from employees working on the targeted properties and residents living on the properties. Captured revenue could then be used to help with development projects. The bills limit total reimbursements for eligible projects across the state to $40 million per year and limit total incentives provided to $1 billion. While there are projects that could qualify for the incentives in the works across the state, according to supporters of the bills, the ones receiving the most attention have been from Gilbert’s Rock Ventures in Detroit. According to material distributed by the coalition supporting the bills, Rock Ventures is planning a $2.5 billion “transformational new development.” The development apparently includes — but is not limited to — a 52-story building at the site of the former J.L. Hudson’s Department Store. Gilbert has argued that incentives would be necessary to make his upcoming projects in Detroit financially feasible. Because he has financial interest in one of Michigan’s casinos, state law bars Gilbert and legal entities controlled by Gilbert from making political contributions at the state level in Michigan. Gilbert has been a heavy donor at the federal level. However, employees of Quicken Loans, especially those who work in government affairs, have been active political contributors of late to state lawmakers. According to campaign financial disclosures, five Quicken Loans employees or individuals tied to Quicken Loans combined to give $35,975 to 56 Michigan House members’ committees between Jan. 1, 2017, and July 20, 2017. Of those 56, 48 voted yes on the main bill in the package. Eight voted no. The five employees were Jared Fleisher, a registered lobbyist for Quicken Loans, Shawn Krause, who leads the company’s government advocacy program, Bill Emerson, vice chairman, Jay Farner, chief executive officer, and David Carroll, a former Quicken Loans lobbyist who is listed as an “executive” on a campaign finance disclosure. Quicken Loans didn’t respond to requests for comment on this story. Fleisher himself gave to the committees of 23 different House members. A call to a number listed on his state lobbyist registration was not returned. The campaign giving of Quicken Loans employees to Michigan House members in 2017 was higher than it was in any of the last four years. While they gave to committees tied to 56 different House members in 2017, Quicken Loans employees hadn’t given to more than 13 different House members in a single year over the last four years. — and Rep. Leslie Love, a Detroit Democrat who spoke in favor of the bills on the House floor and received $1,500. According to lobby disclosures, Love, Durhal and Maturen also benefited from food and drink purchased by Quicken Loans. Love received $201 in food and drink purchased by Quicken Loans over the first seven months of 2017. Durhal received $104. And Maturen received $65. In total, Quicken Loans reported spending $1,164 on food and beverage as part of its lobbying efforts in 2017. That’s the highest total Quicken Loans has reported in a year since at least 2003. House Republicans, like Maturen, interviewed for this story said they supported the new tax incentives long before receiving contributions from Quicken Loans employees. Maturen said there’s a paper mill in his district that could benefit from the new tax incentives. The incentives are needed, he said, because some properties are in such bad shape that they can’t be re-developed without them. It doesn’t make sense to let those properties simply sit there, Maturen said. Vaupel, another Republican, believes one of the checks he received from Fleisher came at a fundraiser. Vaupel’s PAC reported receiving $500 from Fleisher on May 4, the day the House voted on the bills. Vaupel said he would not have known about that particular contribution when he voted in favor of the bills. His candidate committee also received $1,000 from Fleisher on Feb. 21. The lawmaker said he had been supportive of the incentive bills previously. He wasn’t heavily lobbied on the bills likely because the supporters knew his stance, he said.